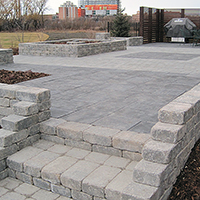 GNF Interlock is a privately-owned company in Manitoba, Canada. We specialize in working with interlocking paving stone, stack stone and concrete to create finished, quality products that will enhance your property’s value and suit your lifestyle needs. With over 21 years of experience, we have the skills, knowledge and specialized equipment to complete all projects – no matter how big or small. We will work with you or your landscape designer to make sure your new driveway, pathways, patio and/or retaining walls are exactly what you envisioned for your property. 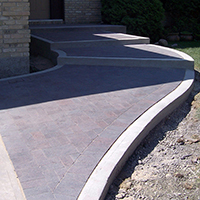 Whether you dream of a new paving stone patio with a stack stone retaining wall, or if you need to replace an old crumbling concrete driveway with beautiful interlocking paving stone, GNF Interlock can turn your dreams into reality. Call us today for a free estimate, and we’ll tell you about our two year warranty. GNF Interlock’s interlocking paver driveways will enhance your property’s value while being as elaborate as you so desire. Our driveways are built using quality products to ensure they have a maintenance-free lifespan. 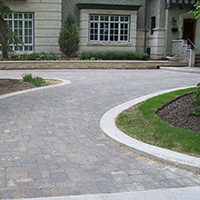 Interlocking paver driveways can include several different stone colours and types of edging. Using a paving stone pattern can turn a large surface area into an interesting, eye-catching space. Choosing certain colours, textures and shapes can also act as an extension of a home’s look and character. We also work with concrete and exposed aggregate surfaced concrete to provide you with a number of options for your driveway. Concrete paver driveways are durable, need very little maintenance, and offer a number of design options with various textures, colours, and patterns to choose from. Let us build a pathway inviting guests into your home and backyard. We will work with you to choose a shape, colour and texture best suited for your taste and landscape surroundings. Interlocking paving stone pathways are not only functional but are also design features that will make your yard stand out. They are durable and easy to repair. Stone patios offer a formal element to any outdoor living space. They require very little maintenance and can last a lifetime. They will also spare you from having to manicure your lawn, and will outlast high-maintenance wooden decks. With a stone patio you can have that outdoor living space to enjoy family barbecues, or to simply relax with a good book. We will help you choose a paving stone patio design that will best suit your needs. There are endless design opportunities including varying the patio stones’ sizes, colours and textures. Retaining walls are practical and can accentuate the landscape features of a backyard. GNF Interlock can build stack stone retaining walls to create elevation change for stone patios, driveways, or for vegetation planters. They can also create an illusion of elevation where only a slight one exists. 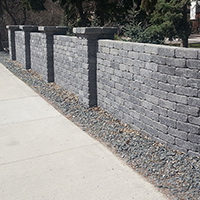 We offer the choice of two different materials – small stack stones or larger retaining wall systems. We can help you choose the best system and style to suit your yard’s needs, as well as the Manitoba climate. Not only eye-catching, retaining walls are useful whereby they can control erosion and can turn previously-uneven surfaces into functional spaces. Welcome guests into your home and backyard with functional, beautiful steps. Choose from a variety of styles including paving stone steps, concrete steps, or retaining wall steps – all of which are safe and secure. We use professional grade concrete glue so the blocks will never move. 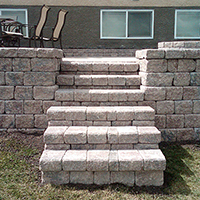 If the steps are incorporated into a retaining wall, we will use the same blocks from the wall to create well-blended wall and step combinations. We can also use any interlocking stone models and colours to cover existing concrete steps, ensuring the project will aesthetically coordinate with your path or driveway. A grade beam is a component of a building’s foundation. GNF Interlock’s extensive experience in pouring concrete grade beams will ensure that your building is solid and secure. GNF Interlock’s concrete pad experience ranges from small pads for barbecues, to large pads for industrial shop floors. We can pour a simple all-concrete pad, or a more elaborate concrete pad with in-floor heating. Your new pad will be durable and will look great. Is there a dip in your driveway? Is your retaining wall no longer standing tall? GNF Interlock offers repair services to existing paving stone and concrete work. We can provide you with our expert opinion when assessing the situation. If a recommendation is made for either a repair or a replacement, you can trust in our experience and knowledge that the job will be done right. GNF Interlock’s Bobcat fleet is at your service during Manitoba’s winter months. Our snow removal service is timely and reliable, specializing in clearing large parking lots.